We run regular bodyweight workshops in London coached by Fi Silk, the UK’s most influential female bar calisthenics athlete and OCR competitor (watch Fi do her thing). Learn how to pull, push, dip, lever and otherwise manipulate your body into amazing shapes! Develop that elusive upper body strength and agility. Get strong using just your own body as resistance – no need for weights or gyms! We’ll break down the skills into simple progressions, making it easy for you to build the strength to execute impressive moves like pull up, dip and even muscle up! These workshops are suitable for beginner to intermediate level. All movements are scaled to the current strength level of the participant. What’s it like on a bodyweight training workshop? We’ll let our clients tell you themselves! These training days are suitable for anyone, female or male, who wants to get stronger and fitter through bodyweight training. You can be a complete beginner or someone looking to improve, as you can work to your own current level. We will break all movements down into simple progressions, from really easy to pretty challenging. It’s up to you how far you go! Some participants are working on muscle-ups and back levers, while others are aiming to get their first pull up. You don’t need to be able to do a pull up in order to do these workshops 🙂 But if you want to get one, this is a good place to start! Come along and have a go just like these folks did! You will be supported, encouraged and inspired – and you’ll have a lot of fun! Scroll down for dates, venue and booking. Nearest tube: Vauxhall (Victoria line). Also many buses stop at Vauxhall bus station. Nearest London terminus is Waterloo. Each individual workshop is £75. You can save £25 if you buy a ticket for both workshops. Booking is not currently open. Fiona is the UK’s foremost female bar callisthenics athlete. She has competed in numerous competitions and jams, sometimes as the only woman, holding her own with the guys. 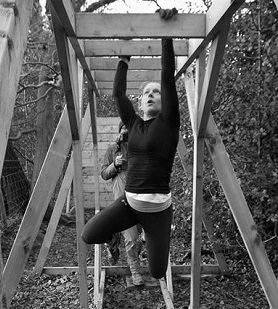 Recently Fi was the ladies winner at inaugural Dirty Dozen Backyard Jam, an obstacle race so fiendishly challenging that it is by invitation only! Fi is often to be found honing her skills at the famous Primrose Hill outdoor training area with some of the best callisthenics peeps in the UK. Fi has been selected for the first UK Ninja Warrior televised competition. Filming takes place in March-April 2015. Look out for it on ITV soon!